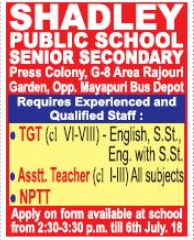 Shadley Public School, Delhi has advertised in THE HINDUSTAN TIMES newspaper for the recruitment of TGT plus Assistant Teachers jobs vacancies. Interested and eligible job aspirants are requested to apply with in 6th July 2018. Check out further more details below. About School: Shadley Public School was established in 1969.Since its inception, it is committed to render selfless service to children. To motivate, design, dedicate young mind to boldly face the challenges that lie ahead in their lives. It got Recognition in the year 1983 from Education Department and is affiliated with CBSE since 1993. It is located in the heart of West Delhi. It boasts of premium extra curricular infrastructure for its students. The faculty is fully trained and disciplines in their subjects. Sports alongside education is encouraged at all levels within the institution. The school premises are adequately equipped with disaster management facilities and 24 hours round the clock CCTV surveillance.